Many people assume that any plumber will be qualified to handle whatever task may be at hand, but this is not always the case. There are many general plumbing tasks that are easy to do, but even for simple jobs, it is necessary to find the right professional. For example, a plumber may need to have special certifications to work on certain types of jobs, and not all plumbers will be qualified. When looking for the best plumber for the job, there are many different variables to consider. A professional’s years of experience and areas of expertise are just as important to weigh as his or her certifications. A plumber’s reputation and professional policies are also worth considering in your decision. Below, learn valuable tips that will help you pick the best professional for any plumbing needs around the house. Apprentice plumbers work under the supervision of a more experienced professional. 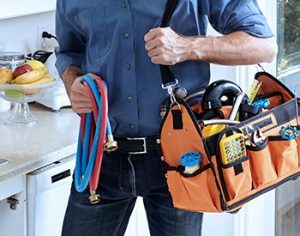 Apprentices must attain several years of on-the-job training, meaning that they are rarely qualified to perform official plumbing work on their own. Journeyman plumbers have undergone all of the necessary work of an apprenticeship and have obtained a license to provide services independently. To qualify as a journeyman, a professional must pass an exam. Master plumbers have the most professional experience when it comes to plumbing, but they also usually need to compete a degree program at a vocational or training school. To get licensed at the master level, a plumber needs to work as a journeyman plumber for a certain number of years. Furthermore, master plumbers must complete ongoing education to retain their licensure. Note that the exact qualifications and the required years of experience for each level of plumbing will vary by state. Always check the licensing requirements where you live to see what qualifications a professional needs in order to be considered a journeyman or a master plumber. Handymen or general contractors who offer plumbing services may or may not be qualified to perform the official duties of a journeyman or master plumber. You should always be careful about hiring an unlicensed or uncertified professional, regardless of how good he or she may be with plumbing tasks. In addition to state or local licensure, plumbers oftentimes need to obtain certifications in order to perform their jobs. Licenses and certifications are required due to the fact that plumbing work can affect public water supplies. Not only is an unlicensed professional going to be less effective at his or her job, there is also a greater risk of contamination when unqualified individuals work on plumbing systems. It is not enough to take a plumber’s word when asking for licensure and certification. Many handymen claim they are qualified to do plumbing work when they are not. Avoid costly and potentially hazardous situations by verifying a plumber’s licensure and certifications before hiring him or her for the job. In many cases, it is beneficial to hire a plumber who is insured. Depending on where you live and what the local licensing laws are, it may also be a good idea to make sure your plumber is both bonded and insured. In case anything happens on the job, insurance will protect the plumber, and your family, from injuries or accidents. Plumbing is one of the most important components of a house, and you don’t want just anyone working on your system. Licenses, certificates and insurance are necessary when making sure a plumber is qualified and covered to do a job. However, a you will not always get a good feel for a plumber’s reputation and professional attitude just by checking his or her qualifications. Referrals and testimonials can sometimes be found online, but it is a good idea to ask people in your network for tips, as well. Asking friends and neighbors is even more important if you have just moved to a new area and are unsure of where to start looking for home maintenance professionals. Comparing professionals before making a decision is always a good idea. Comparison shopping will give you more peace of mind that you are getting the most value for your money, while also forming a relationship with someone you can trust. When looking at prices and policies, be sure to check whether plumbers charge by the hour or by the job, as this can affect how much you pay for services overall. Who will be performing the work. When dealing with a larger plumbing company, you will want to find out who is showing up at your house to do the job. Whether the plumber cleans up after a job. Unfortunately, not all plumbers will take away old plumbing components after making a repair. In many cases, it is your responsibility to dispose of these items and clean up after a plumber leaves. When and how payments are due. Even if you have a general idea of how much you will owe for a job, it is helpful to learn about the plumber’s payment policy before he or she shows up at your house. What the policy is if something breaks or malfunctions. As with any repair job, there is always a potential that something will go wrong in the process. Make sure you know what the plumber’s policy or guarantee is if something breaks during the job or if components fail after the plumber leaves. Once you have selected a plumber, make sure you get estimates and contracts on paper, rather than relying on verbal agreements. Any estimate you receive should contain a detailed breakdown of the anticipated expenses. If you have made other arrangements with the plumber, make sure these agreements are put in writing as well.